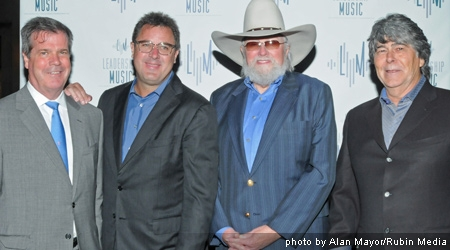 Randy Owen, alongside fellow country music legends Vince Gil and Charlie Daniels, was honored in Nashville yesterday with the Leadership Music Dale Franklin Award which recognizes musicians for humanitarian efforts and leadership by example. The evening featured tribute performances from select artists such as The Grascals, Little Big Town, David Nail, and The Time Jumpers. Little Big Town and David Nail paid tribute to Randy Owen and Alabama with performances of "My Home's In Alabama" and "Feels So Right." To read more about the ceremony, please visit countryweekly.com!